In May, CDHP expressed our excitement over a new informational bulletin from the U.S. Centers for Medicare and Medicaid Services (CMS). It clarifies the intent of existing federal policy to ensure children’s individualized benefits and care. The bulletin also reiterates expectations for state-level periodicity and payment policies that influence how care is provided in these programs. We see it as a call to action for state Medicaid and Children’s Health Insurance Program (CHIP) agencies, advocates, and policymakers alike to move beyond a one-size-fits-all approach to children’s oral health care. We see it as a call to action for state Medicaid and CHIP agencies, advocates, and policymakers alike to move beyond a one-size-fits-all approach to children’s oral health care. This short guide briefly reviews the CMS informational bulletin and how state advocates can work with Medicaid and CHIP officials, providers, and families to ensure these programs truly meet every child’s needs. 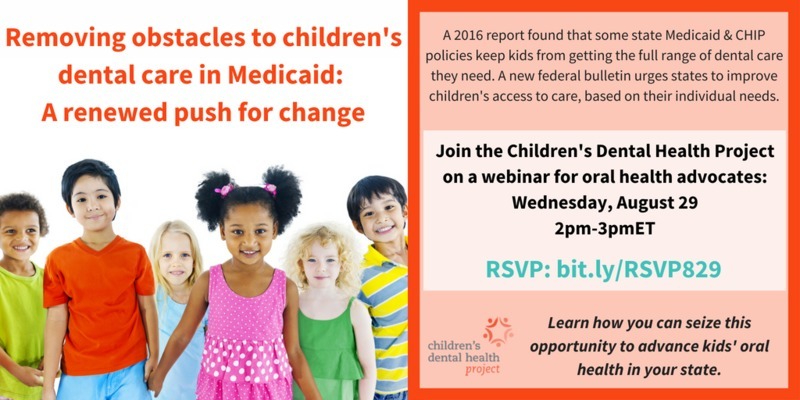 In addition to the quick guide, CDHP will hold a webinar on Wednesday, August 29 to dig further into the CMS bulletin and policy levers that local stakeholders can use to advance progress for children in their state. Register at bit.ly/RSVP829. CDHP is particularly grateful to the partners joining us on this webinar. We’ll hear from former CMS Senior Policy Advisor for Oral Health, Laurie Norris; Marielle Kress from the American Academy of Pediatrics; and Kelly Whitener from the Georgetown Center for Children and Families. These experts will share deeper insights about the CMS bulletin and its implications, as well as efforts currently underway to realize the promise of Medicaid’s children’s benefit. In general, the bulletin makes clear that each child’s oral health care should be based on their individual needs. As state policies should not impede such care, it calls on states to review their periodicity schedules and payment policies. CDHP believes the CMS bulletin reinforces policy recommendations we have long sought to implement, such as institutionalizing clinical guidelines like those established by the American Academy of Pediatric Dentistry and the American Academy of Pediatrics. It also includes making full use of tools like caries risk assessment to identify and manage child and family risk factors before tooth decay takes hold. Achieving the vision laid out by the bulletin will be no simple task, but we hope our new material will support success for states, children, and families. Registration and additional details about the August 29 webinar can be found at http://bit.ly/RSVP829.